” O Romeo, Romeo! Wherefore art thou Romeo?”. Who doesn’t know this lines? And who doesn’t wish once in his or her life bring his or her lover to see Verona, the city of the tragedy and the love of Romeo and Juliet? You can have a beautiful occasion this September to go with your beloved and party for Juliet’s Birthday!!!! Juliet, the most famous beautiful 14- in a half year-old girl, the symbol of perfection and innocence, is going to be celebrated her b-day as every year in Verona. The city’s parties are on September 16th 2011 for honouring the birthday of its most famous heroine. But why this date? 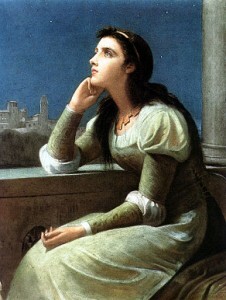 In spite of the word of Shakespeare that put the Juliet birth on “Lammas Eve at night” (August 1), so Juliet’s birthday is July 31, the actual date is based on the “novella” by Luigi Da Porto (1531), the first writer who told the story of Romeo and Juliet. The story of the two most famous and unfortunate young lovers who had lived at the beginning of the 14th century and belonged to two rival families, the Capulets and the Montagues reached the sublime artistic expression in Shakespeare´s “Romeo and Juliet” (1596). After you have joined this event, you may go on julietclub you can also partecipate to a very lovely award called the “Cara Giulietta” (“Dear Juliet”) usually awarded on Valentine´s Day. It goes to the most compelling letters received during the previous year. the prize has been organisedover the years by The Club di Giulietta, a Verona-based organization that answers the thousands of letters addressed each year to Shakespeare´s Juliet. Since the 1930s, letters addressed to Juliet keep arriving in Verona. As of 2010, more than 5,000 letters are received annually, three quarters of which are from women. The day will be full of love, with parades, dances, and street entertainment. This entry was posted on Tuesday, August 9th, 2011 at 4:38 pm	and is filed under Events in Italy. You can follow any responses to this entry through the RSS 2.0 feed. You can leave a response, or trackback from your own site.